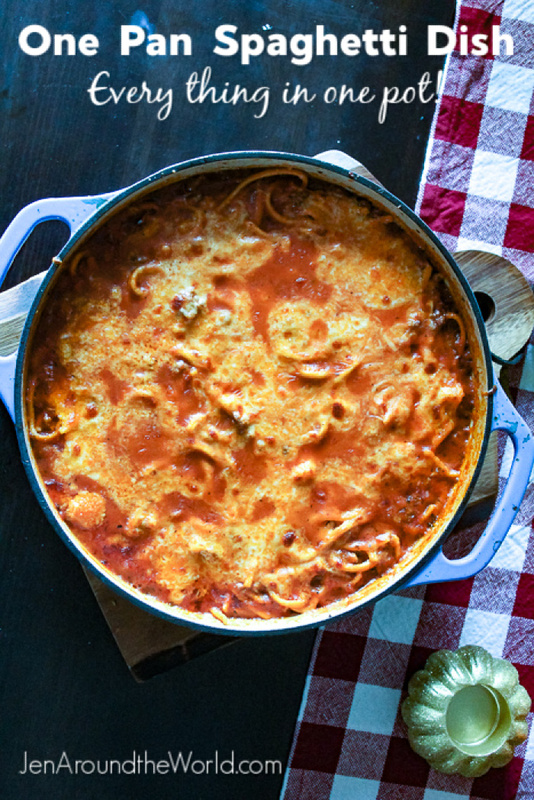 Best One Pan Spaghetti Dish is one of the easiest meals I have ever made. I mean, the fewer dishes, the better right? 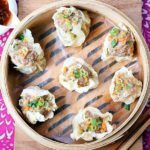 I love sharing easy to make recipes with y’all — especially ones that I can cook in 30 minutes or less. What’s even better is when it can all be made in one single pan — like this One Pot Spaghetti dish. Growing up, spaghetti was not eaten in our house that often. My mom and I loved it a lot, but my dad was not a big fan of it. I guess that is why now, I wind up burning my family out on spaghetti! Because of that, I find new and exciting ways to get my spaghetti fix. 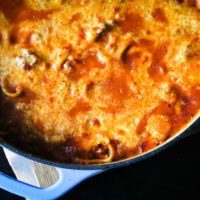 I have made versions of it such as Spaghetti and meatballs, baked spaghetti , Spaghetti Squash (one of my husband’s favorites)- and now my new favorite — one pot spaghetti. I use pasta sauce straight from ALDI to keep things simple. 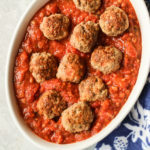 If you have homemade tomato sauce, it should work just fine here, but in my opinion, the ALDI pasta sauce is always so flavorful. They also have an organic version as well. 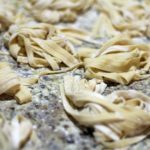 Dried noodles get added right into the spaghetti sauce and boiled. 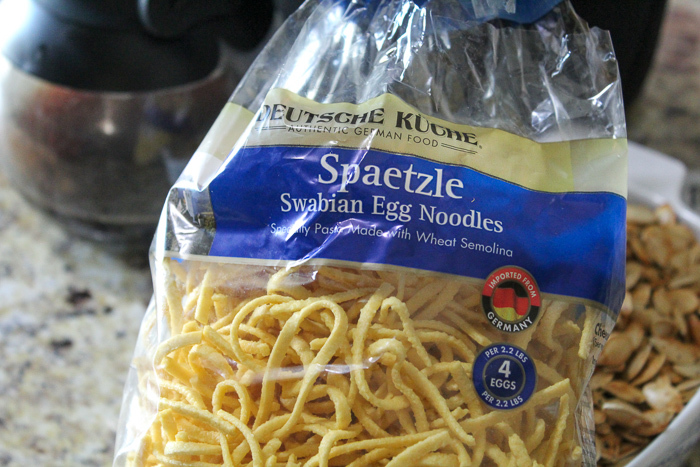 I picked up this pack of German Egg Noodles from ALDI as well and they are so delicious! 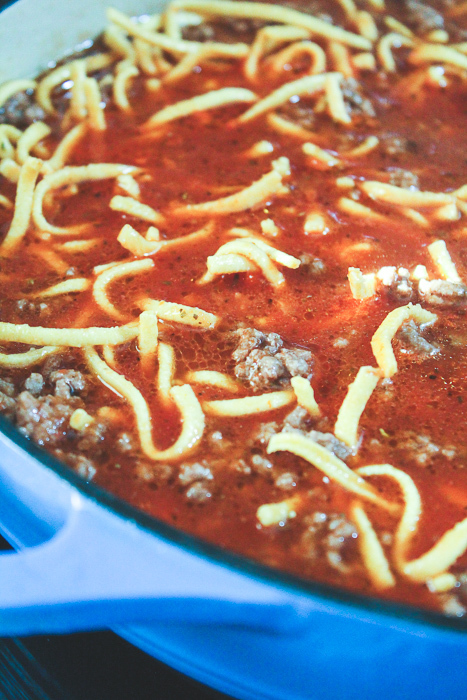 I love the way the noodles soak up the flavors of the spaghetti sauce as they cook. It really helps boost the flavor of the whole dish. 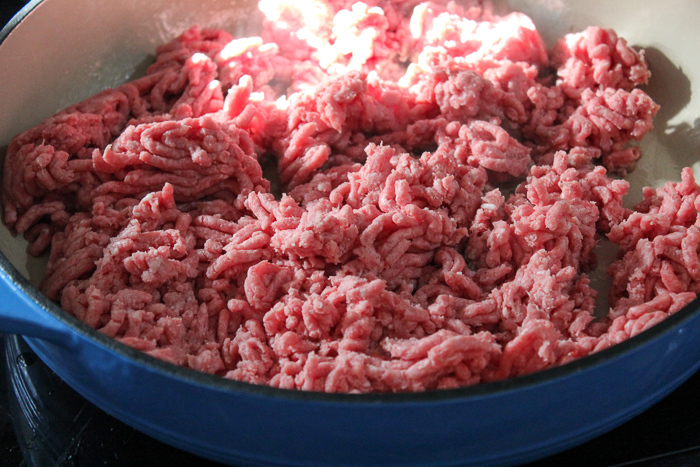 Start by browning your ground beef. If you want, you can add in onions, garlic, peppers or whatever suits your fancy. 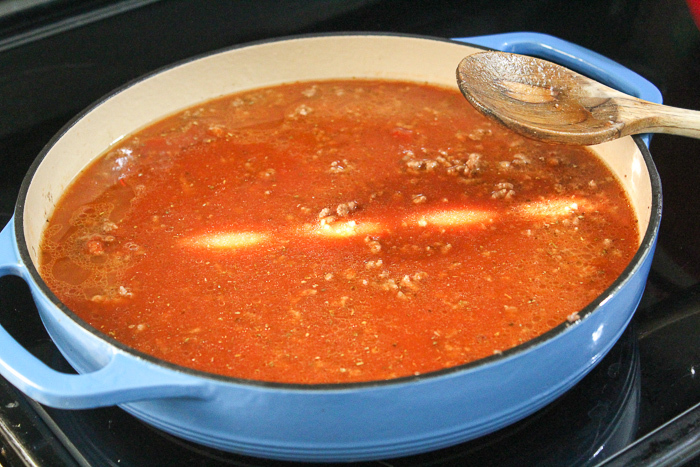 Once the ground beef is browned, drain and set aside while you get the sauce ready. Mix together the spaghetti sauce and the beef broth. 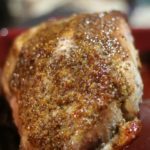 I always like to add in a teaspoon of Italian seasoning as well. I just mix it all up in my 4 cup Pyrex measuring cup. Once I get the sauce mixed up, I add it to the pan where the ground beef is. I make sure it is all mixed in really good. Once I get all of that added in, now it’s time to add in the noodles. Make sure that all the noodles are covered by the sauce mixture. Let it boil for about 7-9 minutes or until the noodles are cooked through. Now, top it with cheese and place under the broiler for about 3-5 minutes or until the cheese is melted all the way through and browned on top. Be careful, because it will be piping hot when it comes out of the oven. 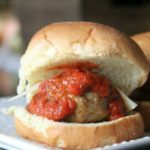 I serve this alongside garlic bread I make using Bay’s English muffins. 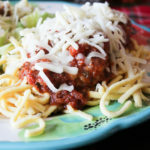 The easiest, most delicious spaghetti you’ve ever made! 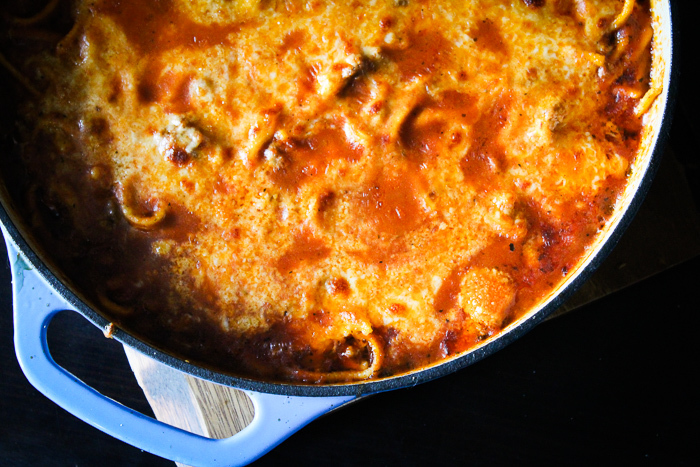 It's full of cheesy flavor, and only one pan to cook in and clean! Heat a large, deep-sided, oven-safe skillet over medium heat. Add the ground beef, season with salt and pepper, and cook, stirring occasionally, until browned. Drain fat and return beef to skillet. 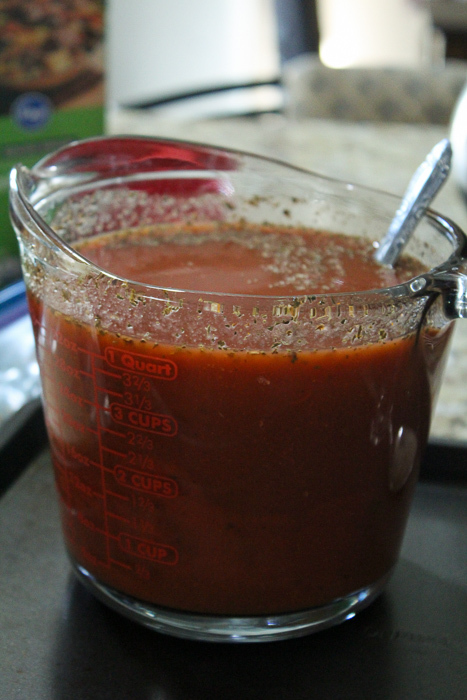 Pour spaghetti sauce and beef broth along with Italian seasoning into a large measuring cup and stir to combine. Take your noodles and add to the skillet. If using spaghetti noodles, you will need to break them in half. Stir noodles into the sauce and make sure they are fully submerged in the liquid. Be sure to stir frequently so that they don't stick. Bring the sauce to a boil and cook for 7-9 minutes, stirring occasionally, until the noodles are tender. Sprinkle on the mozzarella and parmesan and place under the broiler for 3-5 minutes until the cheese is melted and slightly browned on top. Sprinkle with fresh chopped parsley for garnish (if you want). That looks so good! I love adding in the cheese at the end. You have made the ultimate spaghetti! Woot! 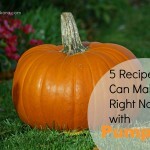 Wow, what a great recipe! I love that you don’t even have to turn on the oven, and you only have one pot to clean! 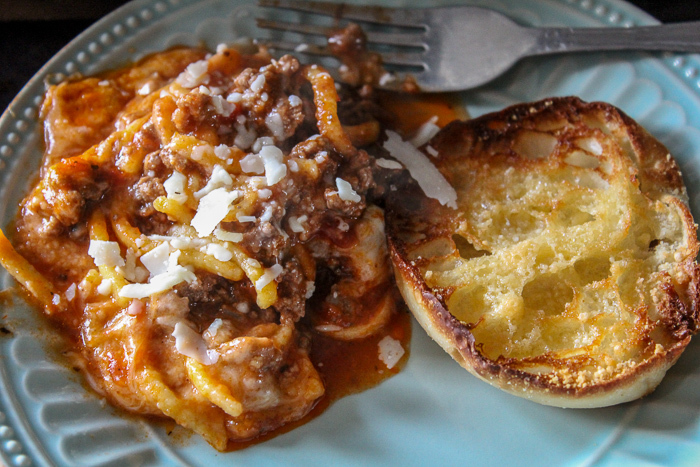 I think I might be the world’s biggest fan of one pan meals – especially on busy week nights. They are the best! The Italian in me is saying that my whole family would love this! This looks so good! I love a good pasta meal for the fall. Ohhhh, it’s so pretty and bubbly and cheesy! 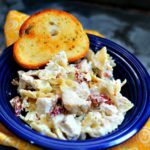 I want to try this – it looks delicious and I love that it’s in one pot! This looks so good. I need to save this so I can make it sometime. We love spaghetti, so I bet this will taste great. 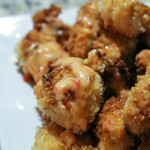 I totally need to make this! I’m a huge fan of spaghetti dishes and a huge fan of one pot cooking! We don’t have an ALDI near me, which is so sad, because when I lived in Indiana, it was the place I did the majority of my shopping! This looks so good and I love dinner that takes few dishes. I’ve always wanted to try cooking with Spaetzle too! Every thing in one pan! Such a great idea! 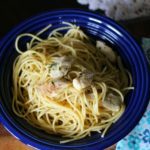 Everyone in my family loves pasta so it will be a hit! I love how easy this is to make! Looks really good! This looks amazing! I am so excited that it only takes one pot!